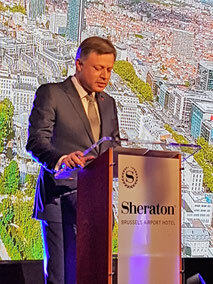 At the New Year’s Reception of Brussels Airport Company CEO Arnaud Feist praised the airport’s 2017 cargo volume, the best in 10 years’ time. On the other hand, the noise fining problem remains BRU’s sword of Damocles, he admitted. Mr Feist also announced a more than €100 million investment in Brucargo, without going into specifics. On the other hand he express a profound feeling of uneasiness due to the noise fines imposed by the Brussels Region. Mr Feist recalled his speech of last year in which he had addressed the politicians to finally solve this issue once and for good before the electoral campaigns for the 2019 scheduled national elections start. However, “one year later, this solution is nowhere in sight,” he regrets. “This will only cause more problems for both our night and day flights, hence for passengers and cargo alike.” As for the latter, he estimated that the traffic shift from Amsterdam to Brussels is precarious and temporary. “I am convinced that Amsterdam will find a solution very fast.” If so, BRU will inevitably lose cargo flights if no lasting noise solution is found, he concluded. The federal transport minister François Bellot planned to commission investigations concerning the impact of noise on the surrounding areas of BRU Airport to a consultancy bureau. But as of now the politician failed to do so.